My daughter participates in AHG instead of Girl Scouts, a growing trend among Christians and conservatives who think that the Girl Scouts have gotten too liberal. It’s your basic God, country, and excellence program focused on civic service, citizenship, and character. Sofia loves it. 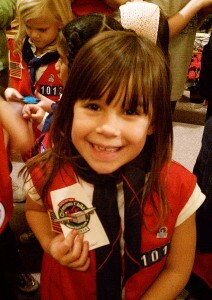 Here she is receiving her badge for participating in Operation Christmas Child.